The Taj Mahal is one of the most photographed monuments in the world. With its stunning ivory-white marble domes, minarets and intricate details it is a photographers dream! 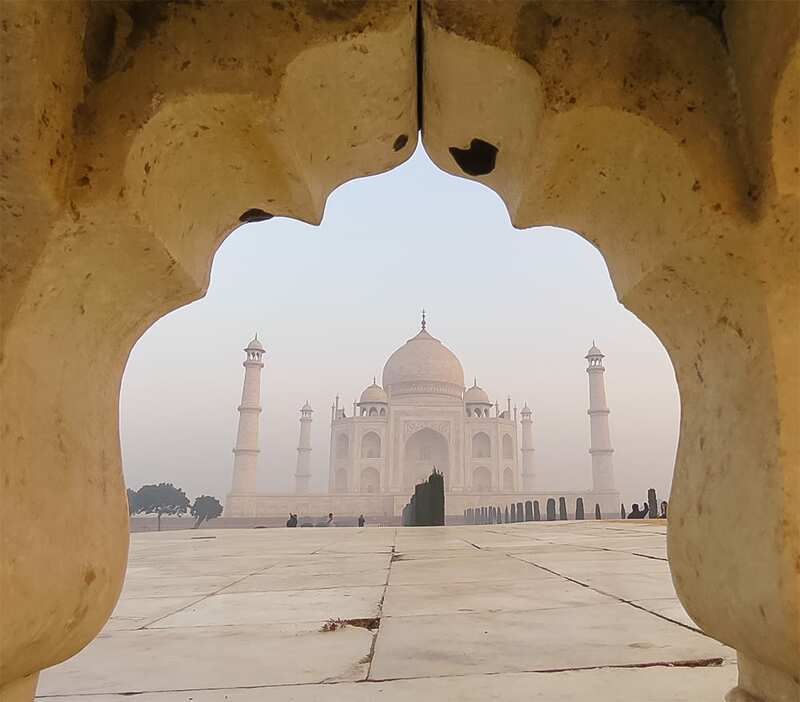 Built in the 17th Century to house the tomb of Mumtaz Mahal, the favourite wife of Shah Jahan, it stands on the banks of the Yamuna river in Agra, the Taj Mahal is rightly one of the Seven Wonders of the Modern World. Sadly the public is not allowed to photograph the tombs themselves, but there is so much in the complex itself to shoot that you will not lack inspiration. 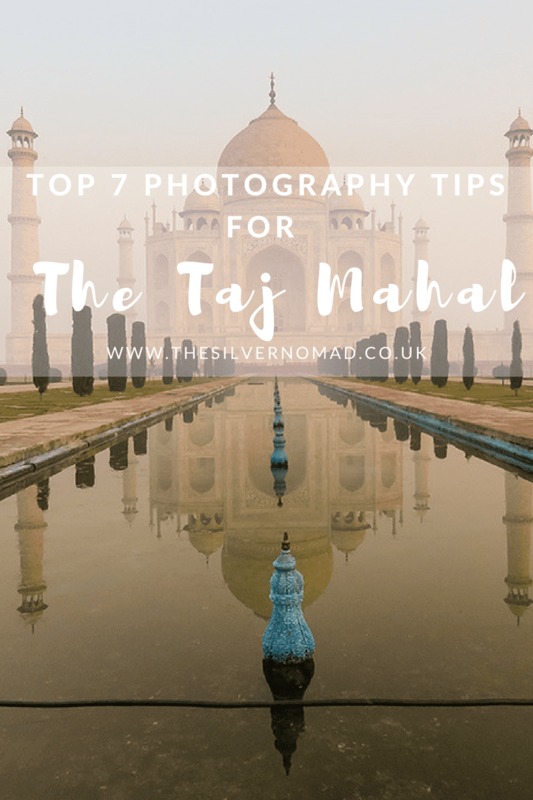 Here are a few tips to help make the best of the Taj Mahal. Ah, the Golden Hour, just after sunrise when there is a rosy, soft glow to everything. 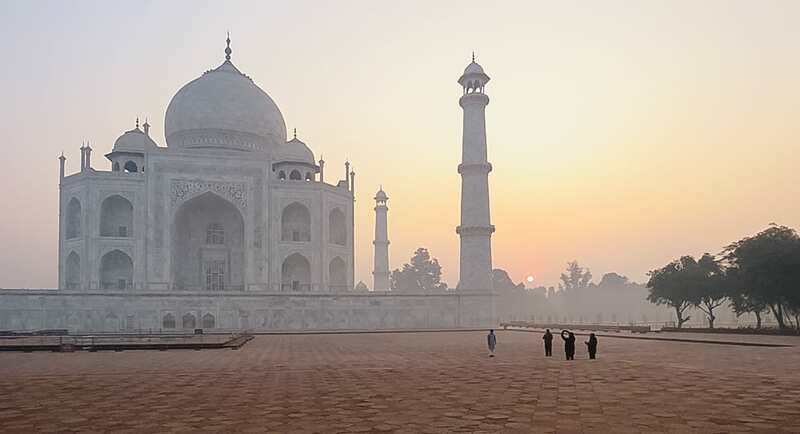 The best time to visit the Taj Mahal is before the crowds start to mount up. Also, it makes for ridiculously beautiful shots with a gentle haze just softening the details. The photo below was taken from the Mosque capturing the sun just rising. If you are looking to the best shots before the crowds take over, try to plan your route. Work out where the sun will be (and the people). Check out Pinterest and Instagram for ideas of shots that you would like to take. We started in front and then worked our way to the left and the Mosque, round the back to the Guest Quarters and then back to the front, through the mausoleum itself, then back to the front. 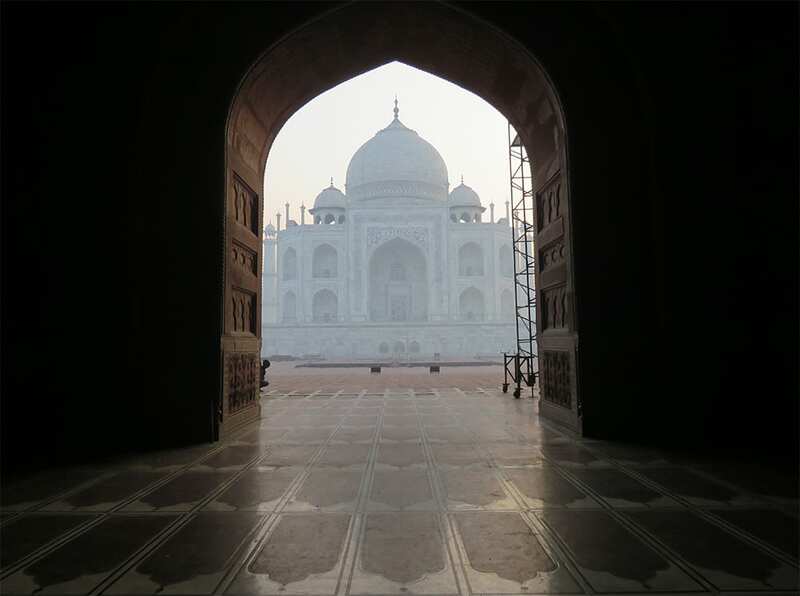 The complex is full of wonderful arches and doorways to take advantage of to frame your shots of the Taj Mahal. Have a look through them at different heights and from closer and further away to get different perspectives. 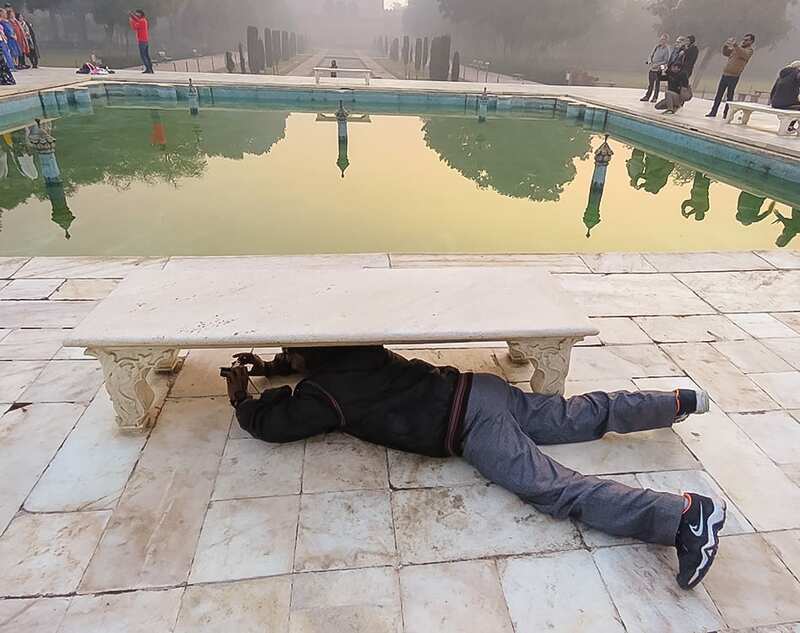 The long ponds in front of the Taj Mahal give an ideal opportunity to capture its reflection, though try to get there early before the crowds obscure the view. You can also get reflections in your sunglasses and if you are lucky (we weren’t) on your eyeball! 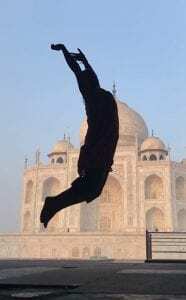 From the Guest Quarters, you can get a clear shot of the side of the Taj Mahal and if you set your smartphone to Slo-Mo and place it on the ground you can get a great silhouette with the Taj Mahal in the background. Be creative with your angles. Sometimes you have to get down and dirty to get a cool shot! The shot below was taken from underneath one of the benches! Play around with your heights. Stand, kneel, crouch, sit on the ground, lie on the ground and look up or use a selfie stick to get height. Don’t forget the view of the Taj Mahal from outside the complex. Look out for rooftop restaurants with clear views and admire it from afar. Take a tuk-tuk to Mehtab Bagh, the beautiful park area across the river from the Taj Mahal. 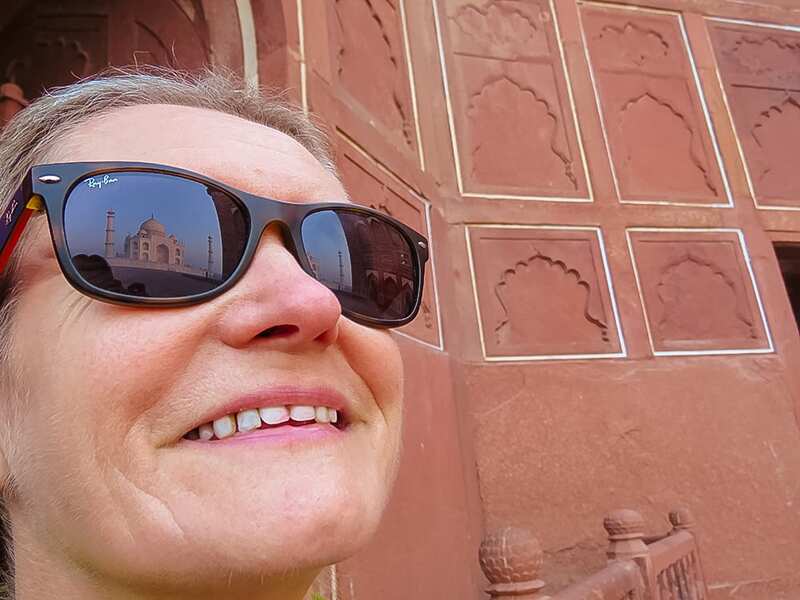 Have a look through the openings in the Agra Fort. 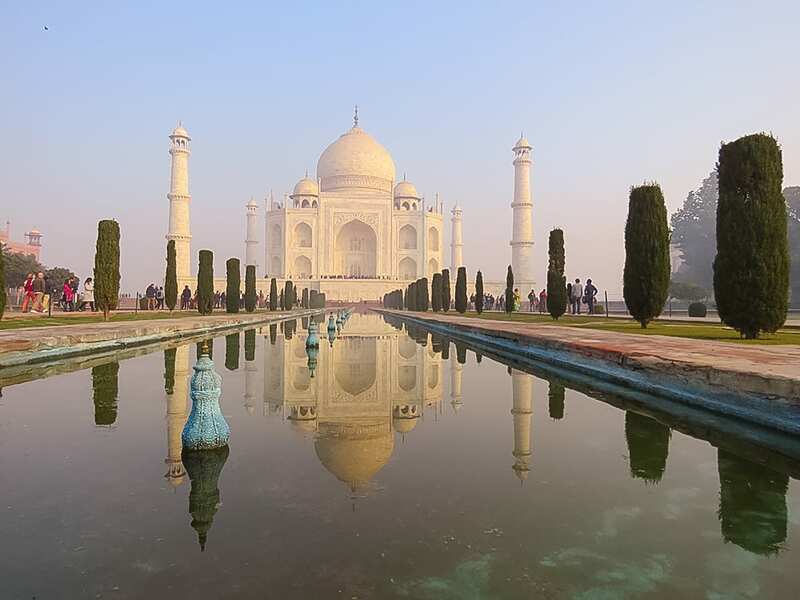 If you want to book a guide before you go, check out these Taj Mahal tours with GetYourGuide. I love being organised before I go, and GetYourGuide allows me to book from home and travel knowing that my tour is all sorted. 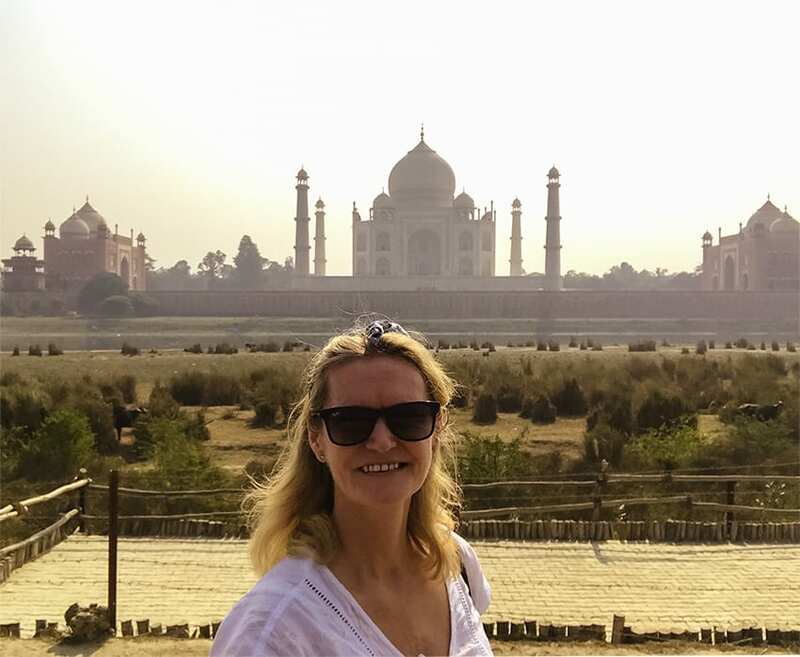 Read more of my travel tips for India here. ← Is Your Name on the Hurricane List for 2018? click a picture from an unusual angle is quite great tip. thanks for the useful tips. keep it up. Thank you Tom, always good to get a different angle!